Charged particles may be small, but they matter to astronauts. 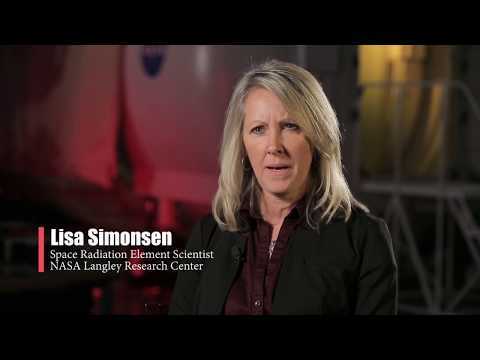 "One of our biggest challenges is protecting astronauts from radiation," said NASA Space Radiation Element Scientist Lisa Simonsen, Ph.D.. "You can't see it; you can't feel it." HOUSTON, TX, September 22, 2017 /24-7PressRelease/ -- Charged particles may be small, but they matter to astronauts. NASA's Human Research Program (HRP) is investigating these particles to solve one of its biggest challenges for a human journey to Mars: space radiation and its effects on the human body. "One of our biggest challenges on a mission to Mars is protecting astronauts from radiation," said NASA Space Radiation Element Scientist Lisa Simonsen, Ph.D.. "You can't see it; you can't feel it. You don't know you're getting bombarded by radiation." A common misconception of space radiation is that it's similar to radiation on Earth. It's actually quite different. On Earth, radiation coming from the sun and space is mainly absorbed and deflected by our atmosphere and magnetic field. The main type of radiation people think of on Earth is found in the dentist's office - X-rays. Shielding against X-rays and other types of electromagnetic radiation usually consists of wearing a heavy, lead blanket. Space radiation, however, is different because it has sufficient energy to collide violently with the nuclei that make up shielding and human tissue. These so-called nuclear collisions cause both the incoming space radiation and shielding nuclei to break-up into many different types of new particles, referred to as secondary radiation. "In space, there is particle radiation, which is basically everything on the periodic table, hydrogen all the way up through nickel and uranium, moving near the speed of light," said NASA Research Physicist Tony Slaba, Ph.D. "NASA doesn't want to use heavy materials like lead for shielding spacecraft because the incoming space radiation will suffer many nuclear collisions with the shielding, leading to the production of additional secondary radiation. The combination of the incoming space radiation and secondary radiation can make the exposure worse for astronauts." The HRP is focused on investigating these effects of space radiation on the human body especially those associated with galactic cosmic rays (GCRs). "There are three main sources of space radiation, but GCRs are of most concern to researchers for a mission to Mars," said NASA Research Physicist John Norbury, Ph.D. "GCRs that come from exploding stars known as supernovae outside the solar system are the most harmful to the human body." Other space radiation sources include the Van Allen Belts where radiation particles are trapped around the Earth and solar particle events (SPEs) which are associated with solar flares and coronal mass ejections and are more likely to occur during times of intense solar activity. But GCRs are first in mind for the HRP researchers who create countermeasures to protect astronauts from space radiation. The challenge is obtaining adequate data on the GCR exposure and biological consequences. Researchers use NASA's Space Radiation Laboratory (NSRL) to investigate the effects of ionizing radiation but space radiation is difficult to simulate on Earth. A radiation dose in a lab setting could be more concentrated and given over a shorter time frame than what an astronaut actually experiences during a year in space. As NASA prepares for a journey to Mars, it will continue to use, enhance and develop a variety of technologies to protect astronauts. International Space Station dosimeters, Orion's Hybrid Electronic Radiation Assessor, and the Radiation Assessment Detector can measure and identify high-energy radiation. Protons, neutrons and electrons may be small but they will always matter to NASA. NASA's Human Research Program (HRP) is dedicated to discovering the best methods and technologies to support safe, productive human space travel. HRP enables space exploration by reducing the risks to astronaut health and performance using ground research facilities, the International Space Station, and analog environments. This leads to the development and delivery of a program focused on: human health, performance, and habitability standards; countermeasures and risk mitigation solutions; and advanced habitability and medical support technologies. HRP supports innovative, scientific human research by funding more than 300 research grants to respected universities, hospitals and NASA centers to over 200 researchers in more than 30 states.